The Open Source SMB1 Engine is an engine created by Hello. 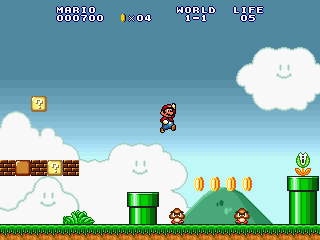 It contained several features from the NES game Super Mario Bros. It was first released on the 18th of June, 2007 on both the main site and the forums. The Open Source SMB1 Engine is imfamous for its glitches, its now-overused SMAS SMB1 graphics, its now-overused SMAS SMB1 Music, its use of the now-overused World 1-1, and the many poor fangames that use it. Its notoriety is similar to that of the Hello Engine series. This page was last edited on 17 April 2017, at 14:10.